There are many ways to care for your dog. Beyond simply looking after their basic needs, it is important to look after them in ways they cannot care for themselves. After all, just because a dog is unable to bathe itself and look after it’s own hygiene in some ways, it does not mean that we shouldn’t do what we can. Dogs make their owners happy every day, with their limitless energy and their happy demeanor. The least we could do as pet owners are returning that favor. There are so many ways that we can help our furry friends have a more comfortable life, and these ways do not require an excessive amount of effort, they simply require us to be considerate. For example, giving your dog a bath may take up half an hour of your time, but it will keep your dog happy for the next few weeks, due to their clean, glistening coat. There are many other ways you can groom your dog and care for it, and today, we will be looking at one of the more simple ways you can care for your pet. As people, we have the ability to trim our nails thanks to our opposable thumbs. Dogs, unfortunately, do not have this luxury. Wild dogs and wolves simply have their claws grow out until they snap, but this does not have to be the case for your dog. A snapped nail can cause pain and bleeding and can even result in infection. Different dog breeds will often have different types of nails. This can mean that your dog’s nails will either grow slower or faster and they will also have a different shape. This can have a major bearing on whether or not your dog will need frequent nail trimming. Most of the time, you can simply look at your dog’s nails and see whether or not they will require trimming. It also helps to trim your dog’s nails when you start to hear them scratching against the floor or when they start hurting you when your dog jumps on you. You should not be trimming your dog's nails more often than twice a month unless your dog's nails grow incredibly fast. Use common sense when deciding whether or not it is the appropriate time to trim your pet's nails. See whether or not they have their movement hampered by the length of their nails, if this is the case, they will require you to cut their nails. You may be surprised to learn that long nails can make it hard for your dog to walk or run around. Long nails can make it, so your dog's paws are painfully positioned as they walk due to the nails arching the foot. If you would like to ensure that your dog’s walking and posture is healthy and does not put them in any pain, you will want to ensure that their nails do not curve beneath the level of their feet. As paw pain will be caused by the manner in which their nails touch the ground before their footpads, you must ensure that this will not be the case while cutting their nails. If you neglect to cut your dog's nails in a timely fashion, it will more than likely result in your dog either gnawing its nails until they break, or they will simply snap off as your dog walks. While this may not seem all that bad, you will want to avoid this for several reasons. The main reason is that, for a dog, snapping a nail off is a harrowing experience. Dogs have sensitive nerves on the inside of their nails, and having these nerves exposed due to a broken nail will cause your dog quite a lot of pain, sometimes to the point of limping. Besides the aspect of pain, it is also important to consider the long-term health of your pet. As a snapped nail will often result in a bleeding wound, your dog will also be at risk of an infection. This is an even higher risk due to the manner in which dogs tend to walk and play in rather unsanitary areas. When you are trying to cut dog nails, there are a few things you should consider. It is a good idea to start dog nail clipping at a young age so they can grow accustomed to the process. If you wait too long, your dog may be uncomfortable with having its nails cut, or it may even be downright hostile when you attempt to do so. Dogs’ nails tend to be very sensitive, as with most parts of dog paws, so it is important to take a good measure of care when you decide to cut your furry friend’s nails. If you look at your dog’s nails from the side, you will often be able to see a bit of pink, this is the root of their nail, and you must take care not to cut this part. 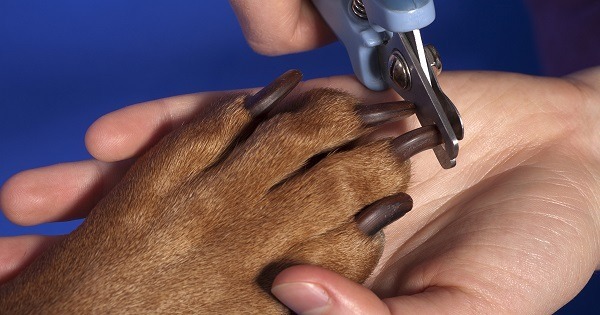 To accurately cut your dog's nails, you will have to firmly grasp their paw in one hand and use the nail clipper to cut only the part of the nail to which the root does not extend. If you cut your dog's nail too deeply, your dog will be hurt immensely and may even bite you on reflex, so take care to muzzle more aggressive dogs before cutting their nails. Cutting your dog's nails do not have to be a painful process for you or your pet. You will find that grooming your pet becomes far easier once you have a good measure of experience doing it. We hope that this guide has proved helpful.